Originally settled as farmland in the 1640s, the area retained its largely rural character until 1923, when a 167-acre plot of land was purchased from the nearby Vanderbilt family estate for the creation of a new golf club. The golf course was eventually named Glen Oaks, after the sweeping panoramic view from the highest point in Queens. In 1944, the Gross-Morton Company bought 175 acres of land along Union Turnpike. With a loan of $24 million from the Federal Housing Authority, they built Glen Oaks Village, a garden apartment complex consisting of about 3000 units in a series of two-story buildings built in a colonial style. After World War II (1939-1945), the neighborhood’s population began to rise with returning war veterans looking to settle down and raise families. In 1974, construction of North Shore Towers, three 33-story apartment buildings, were erected on the site of the old Glen Oaks golf course. 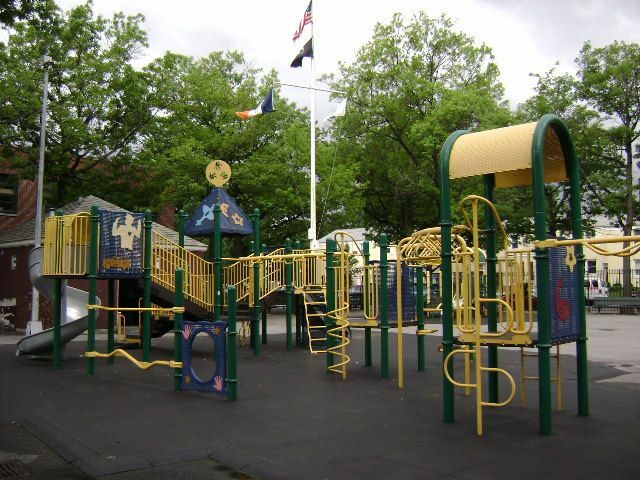 Located on the corner of 72nd Avenue and Little Neck Parkway, Castlewood Playground opened in September 1954. Jointly operated by Parks and the Board of Education, the site contains swings, play equipment, benches, a spray shower, a comfort station, and a flagpole with a yardarm, as well as five basketball half-courts and a 60’ by 40’ pool. In 2000, Mayor Giuliani sponsored a $122,587 renovation of the sidewalks lining the playground as well as building of a retaining wall around the site’s pool.